“Penniman was not erased, it was dispersed” (R. Wythe Davis). While organizing my 2,000+ pages of research notes on Penniman, I found the above quote. It was in amongst some materials shared with me by author and historian Will Molineux. It offers quite an insight on what happened at Penniman after its closing in 1919 (following the Armistice). To really wrap your mind around history, it has to be set in context. And in the early 1900s, we were a very thrifty people. Americans were very wise about salvaging and re-using anything that could be salvaged and re-used, and houses were not an exception. 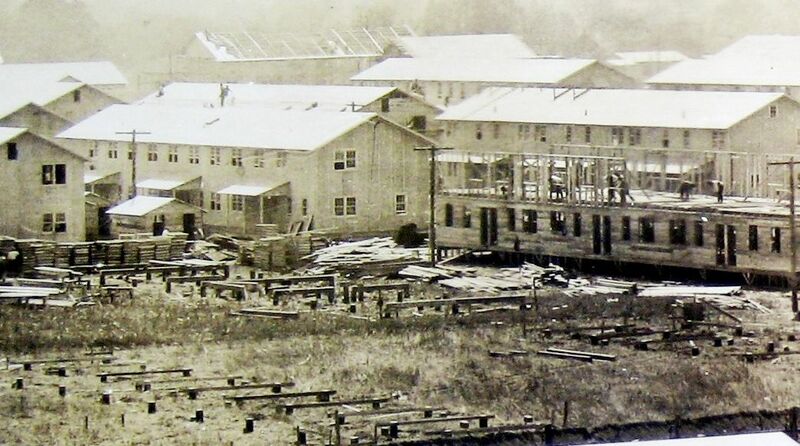 Immediately following The Great War, there was a profound shortage of building materials, making Penniman’s abundance of “almost new” lumber ever more appealing. Newspaper articles reflect that several local developers and real estate men went into Penniman and purchased houses to move to other areas. 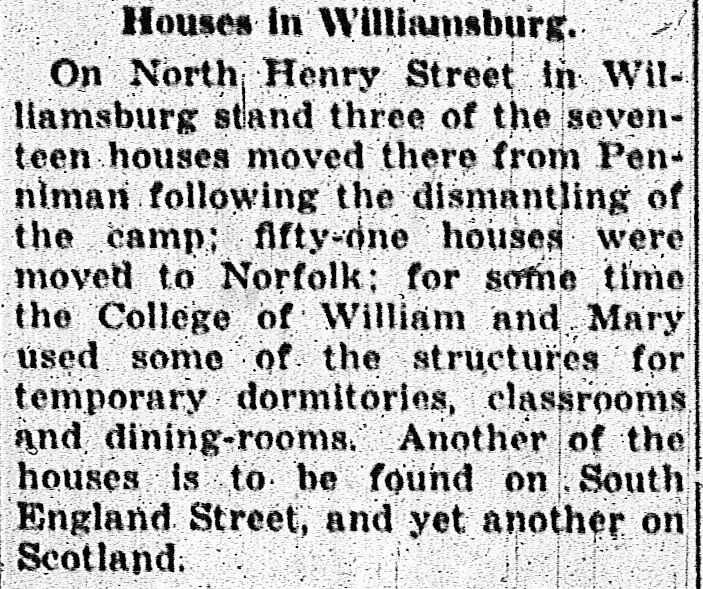 Residents recalled that it was a common sight to see houses being moved down Williamsburg’s streets in the 1920s. An article Richmond News Leader states that local businessmen E. T. Davis and city councilman John Warburton moved several houses out of Penniman. William and Mary College also purchased 5+ Penniman structures over a period of five years. 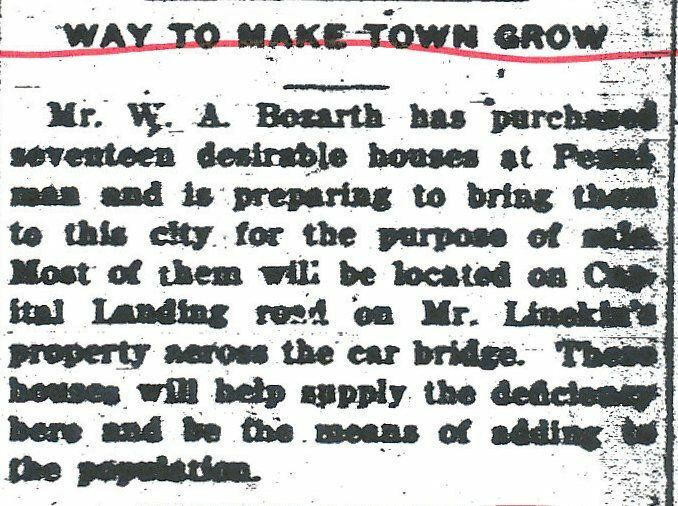 In October 1921, the Virginia Gazette reported that developer W. A. Bozarth moved 17 houses from Penniman to Williamsburg, and placed many of them “on Capitol Landing Road.” Two months later, the Virginian Pilot reported that W. T. Hastings had purchased 40+ houses from Penniman to move into Norfolk, via barge. Sometime in 1923, George Hudson moved more than 20 Penniman bungalows to Norfolk (also by barge). The Richmond News Leader says that several Penniman houses landed in “Newport News and surrounding cities” (Richmond News Leader, June 22, 1938). Mr. Davis was right: Penniman wasn’t erased, it was dispersed. And he’d be in a position to know. He was a Yorktown native, a Navy retiree, and served as Officer-in-Charge of Cheatham Annex for a time. And he was also the husband of Marguerite Bozarth Davis, who was born and raised in a Penniman house on Nelson Street (Williamsburg). Sadly, most of these many Penniman houses landed in the path of Rockefeller’s 1930s redevelopment of Williamsburg. However, Mark Hardin and I have located a handful of the survivors in Williamsburg. It’s likely that there are more than we’ve found. Bear in mind, some of these structures were built as temporary homes, which means that they had tar-paper roofing, siding and temporary wooden foundations. The exterior “walls” originally had horizontal planking (probably 1×4s), covered with Rubberoid (tar paper). It wouldn’t take a whole lot of work to transform that structure into a permanent one by adding clapboards and roofing shingles and setting it up on a substantial (masonry) foundation. 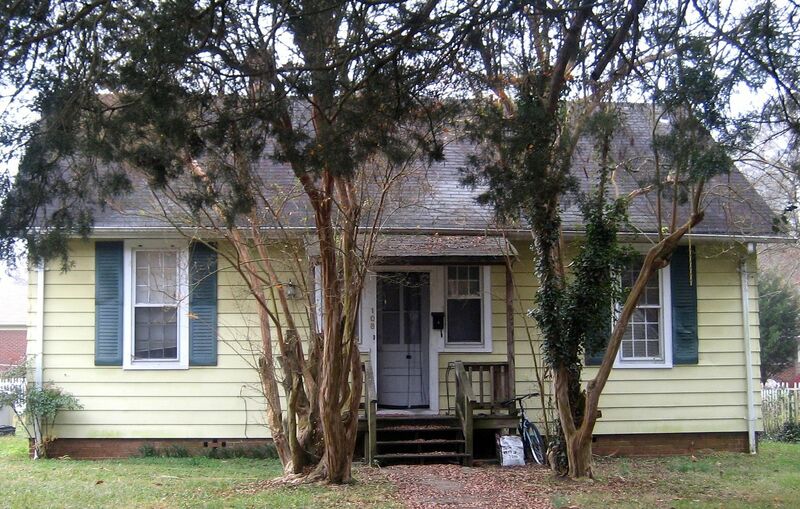 And Marguerite’s childhood home got a second story added, a few porches and solid brick walls. Absent Mr. Davis’ information, I wouldn’t have identified the Bozarth home as a Penniman house in a kajillion years. 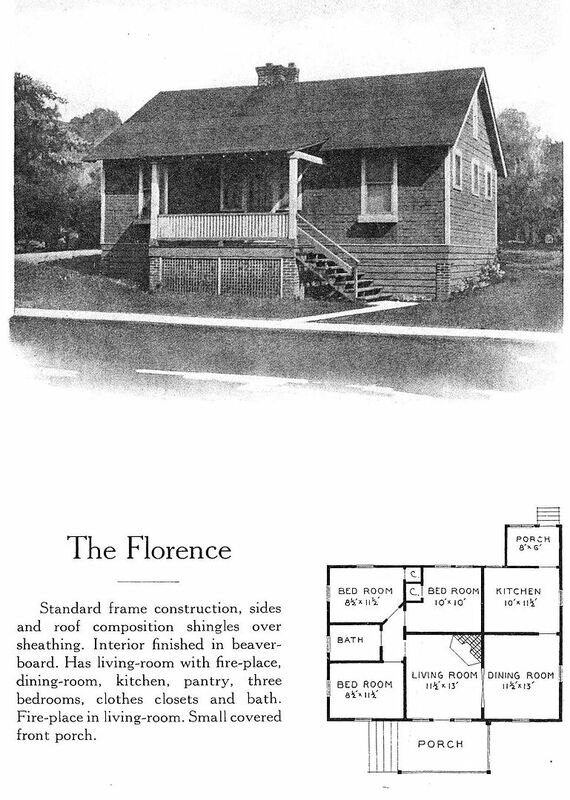 The predominant DuPont design we found in Williamsburg is the "Florence." A notable feature is the windows flanking the front door. Also note the three matching windows down the side (bedroom, bath, bedroom). Check out the description: "Interior finished in beaver-board." In other words, the interior did not have sheetrock, but a product akin to beaded paneling. It was a composite material, made of compressed wood pulp. Today, you'll occasionally find it installed in the attic of pre-WW2 houses. Here's a Florence that Mark discovered, just off Capitol Landing Road in Williamsburg. Seems likely that this was one of W. A. Bozarth's "17 houses" moved out of Penniman. If you zoom in, you can see those windows flanking the door. 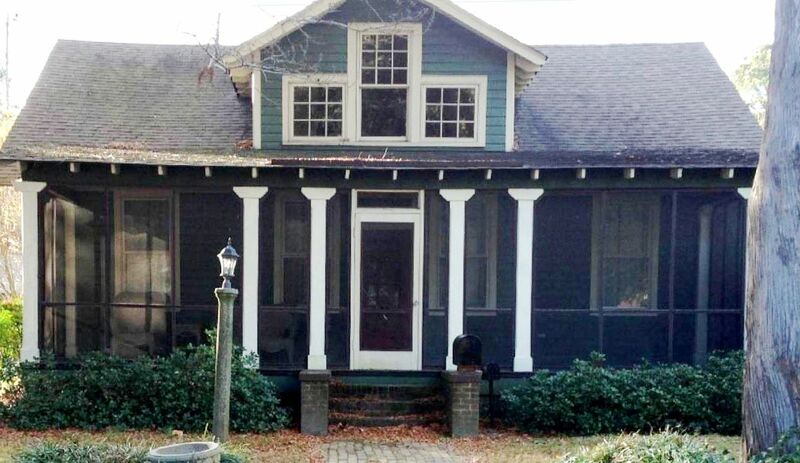 This house is a dandy, because it's in largely original condition. 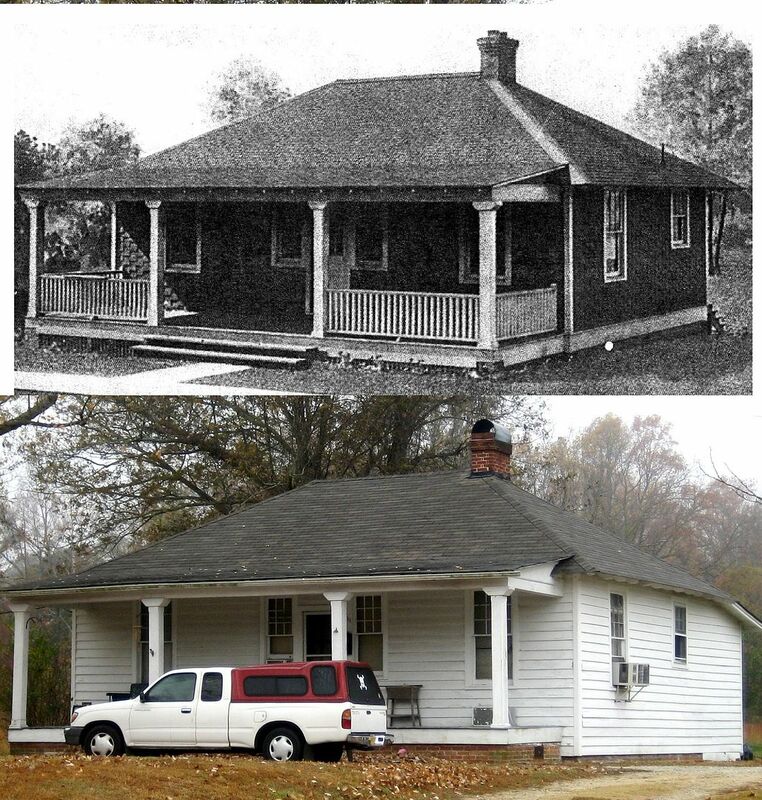 Even that simple shed roof on the front porch is original. Mark also found this Florence on Capitol Landing Road. The windows flanking the door are hidden by the screened-in porch, but if you look hard, you can see them. 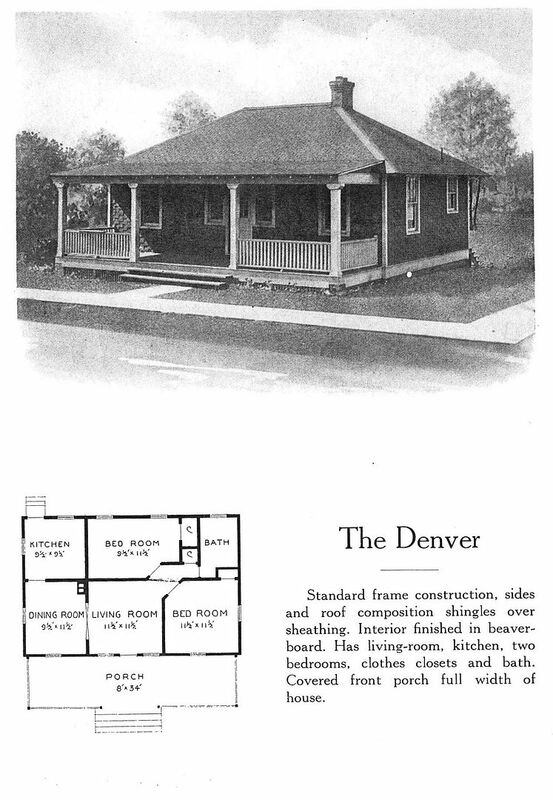 The dormer was probably added when the house was moved, and the Denver-esque porch columns (six total) were also an add-on. 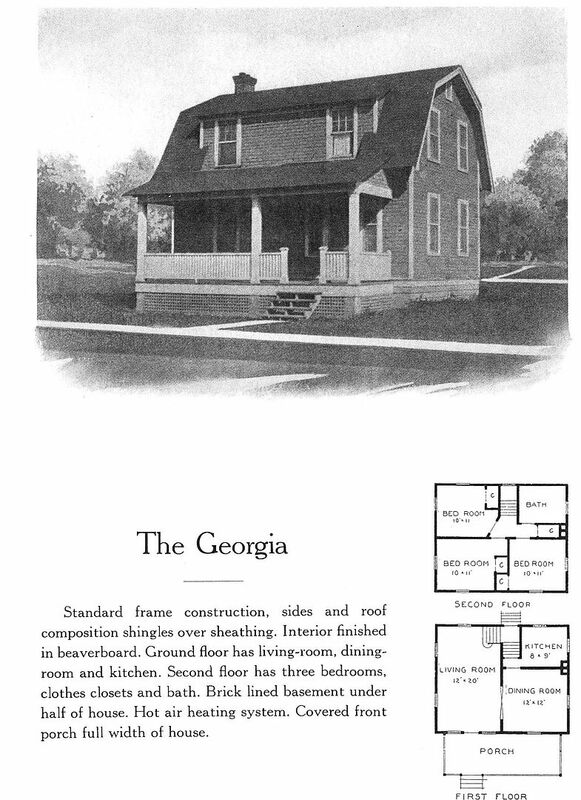 The windows in the dormer (nine lite) wouldn't have been hard to find, considering that Penniman houses were also being sold as "salvage" (in pieces and parts). If you look at the other Penniman houses, you'll see that they had 9/1 windows. Photo is copyright 2013 Megan Hardin and may not be used or reproduced without written permission. Another popular DuPont model was "The Denver." This also had beaver-board interior walls. This DuPont Denver is located on Capitol Landing Road. Sadly, it's surrounded by commercial development which means many of Mr. Bozarth's Penniman homes are now sitting in a landfill somewhere. Fun comparison of the extant Denver with the original catalog picture. Mark Hardin found this vintage picture of a Denver that was located at 811 Capitol Landing Road. 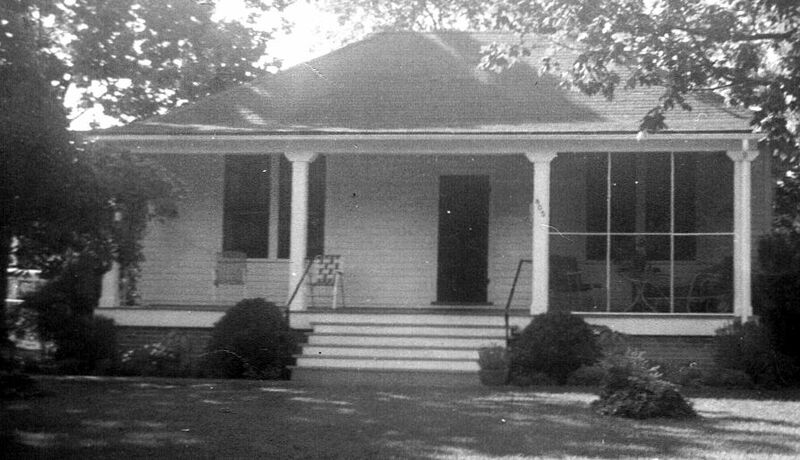 We've no idea when it was torn down, but as Mark pointed out, those look like 1950s chairs on the front porch. How was W. A. Bozarth related to Marguerite Bozarth Davis? The 1940 Census shows Marguarite, age 9, living with her grandfather, James Bozarth. According to R. Wythe Davis, their home on Nelson Street came from Penniman, although it sure doesn't look like a Penniman house today! This article (above) appeared in the "Virginia Gazette" in October 1921. Another design we found still standing in Williamsburg is the Georgia. In Norfolk, we have several of these on Major and Glenroie Avenue (brought here by W. W. Hastings in 1921). There's only one remaining in Williamsburg. 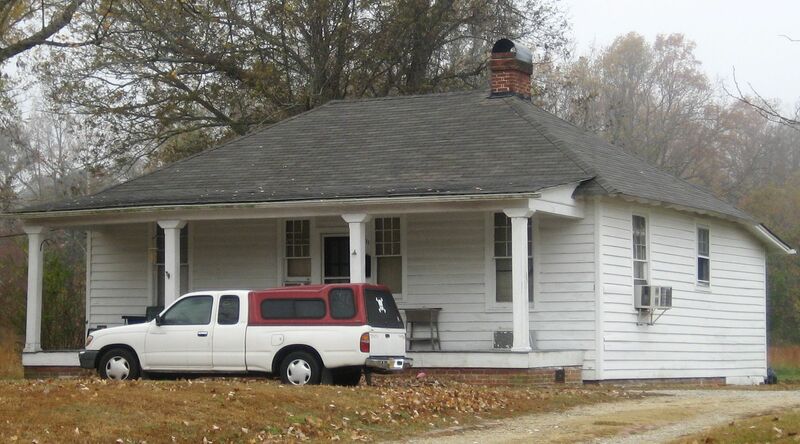 According to the 1940 Census, this DuPont "Georgia" was the home of Augustus Drewery Jones. Mr. Jones passed on in 1977. 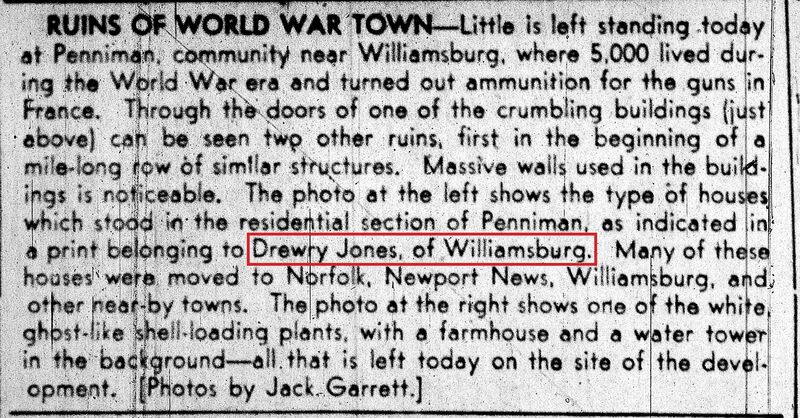 Mr. Jones is of special interest to me because in a 1938 "Richmond News Leader" article, he's given credit as being the owner of some fine vintage photos of Penniman, Virginia. Oh, how I'd love to see those originals! I've contacted his one surviving heir (a couple times) but haven't heard back. Someone must have those originals! Drewery Jones, where are your photos? I'd be happy to find Mr. Garrett's photos, too! The pictures shown in the 1938 "Richmond News Leader" came from Drewery Jones. I have 200+ pictures of Penniman (thanks to Hagley Museum and Library), but I don't have anything from this angle, showing all the pretty little houses. Mr. Jack Garrett took this photo of the ruins of Penniman (as of 1938). In 1938, the "Richmond News Leader" gave some specifics about the dispersing of Penniman. 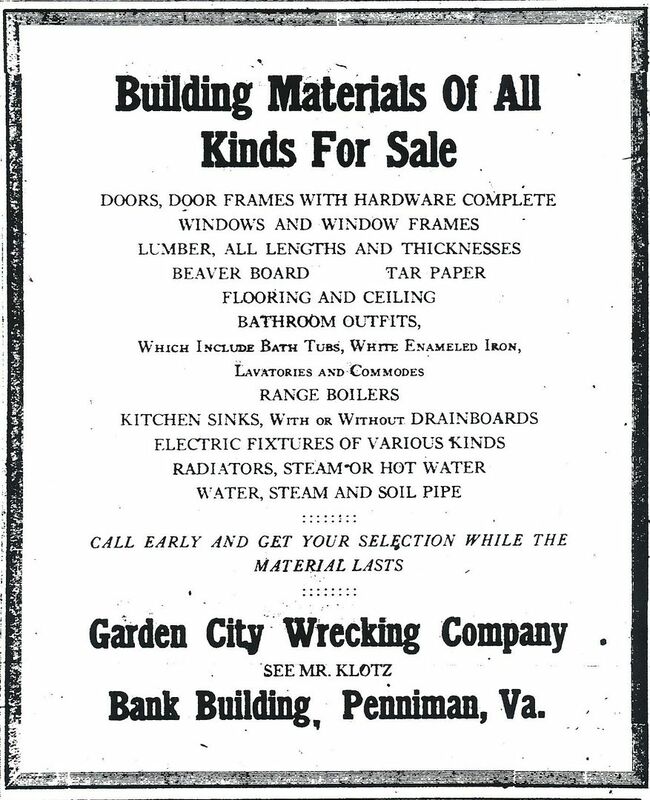 This ad first appeared in April 1921 Virginia Gazette. In the early 1920s, "Wrecking Company" was another word for "architectural salvage." At this point, the houses were being sold in pieces and parts, as well as whole. The house that started us down this long and winding research path: "The Ethel of Riverview." In DuPont literature, this house was known as "The DuPont," and DuPont, Washington (site of a DuPont plant) is full of DuPont "DuPonts," but you can see why we've stuck with the name, The Ethel. Heretofore, the Ethel has not been found anywhere but Norfolk, Virginia. Our Ethels were built at Penniman in Spring 1918 and moved by barge to Norfolk in 1923. Are there more Ethels out there? If so, I wish they'd contact me. Are there more Penniman remnants in Williamsburg that we have yet to discover? I suspect that there are! To see pictures of our Ethels in the 1940s, click here. 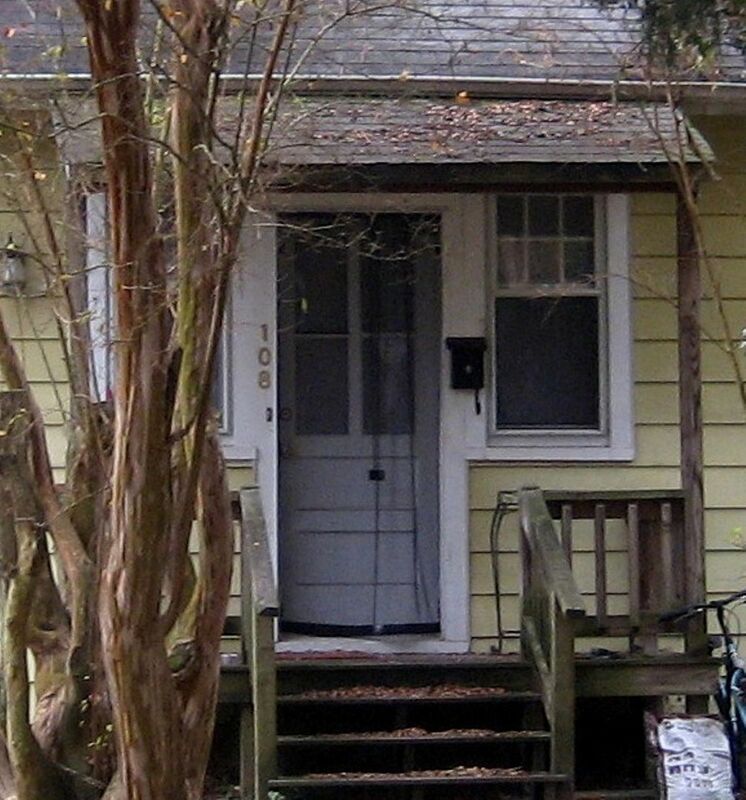 To read about the Penniman houses in Norfolk, click here. I found your article while researching my grandmother, Marguerite Bozarth Davis. 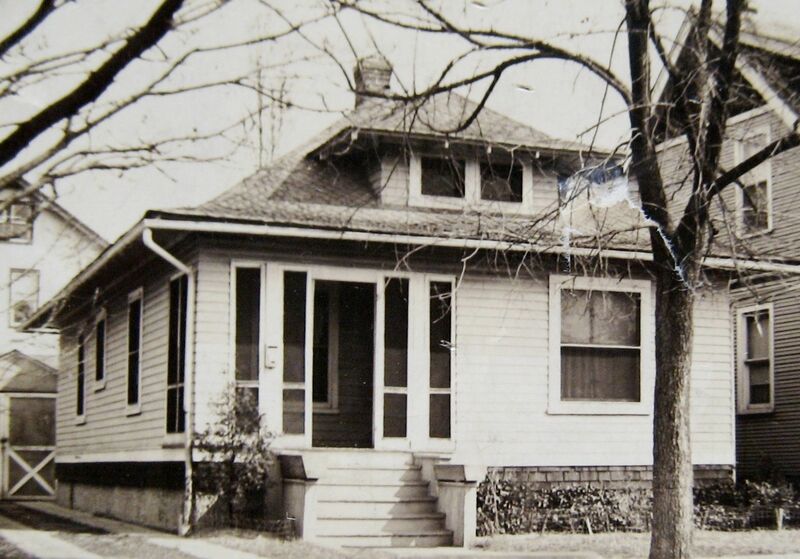 My great grandmother, also Marguerite, lived in the house you mentioned on Nelson Ave. I grew up in that house:) I am so happy i found your article. I am working on my bachelors in History with a concentration in Colonial America, and this has truly made me feel as though I am on the right path. I included a photo of my great grandmother’s house. 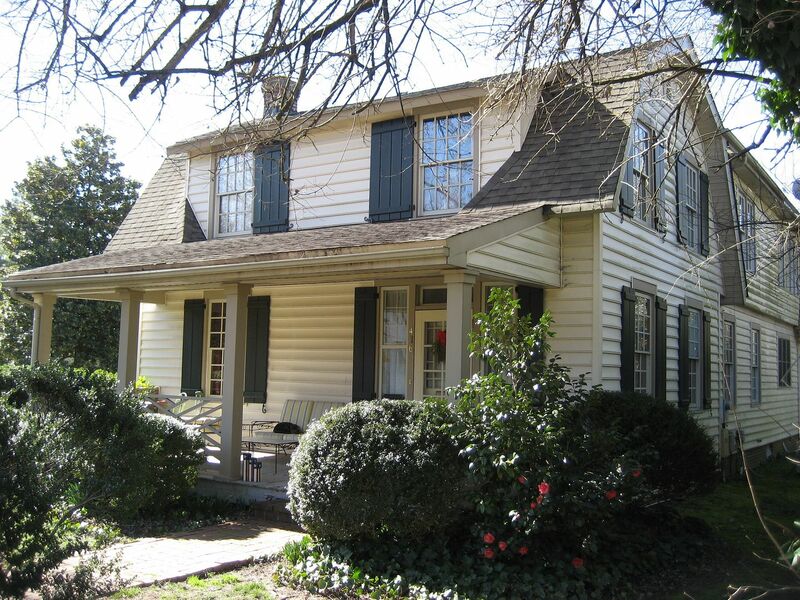 Now, my grandmother and grandfather (Captain Robert Wythe Davis Senior) lived directly next door. I really look forward to hearing from you, and to “talk shop” with a fellow historian. Feel free to email me, if you have the time, of course. I am Marguerite Bozarth Davis’s brother. It is important to note a couple of corrections in those remarks concerning her. First, she was born in a house on the southwest corner of Prince George Street and what is now Armistead Ave. I do not know if that was a Penniman house or not. Floyd T. Bozarth’s family lived there until 1932 or thereabouts. We then moved to JAB’s house on Nelson Ave. and lived there until 1941 except for a three year period from 1934 to 1937. The house on Nelson Ave. was built in 1932 from the ground up. It was designed by Cedric M. Bozarth (J. A. Bozarth’s son). I hope these comments are helpful. Hospitality Seats Travel Back In Time With Me and Say Hello to The Ethels!